Leah Coulter's a major character in Nick Scipio's Summer Camp Universe. She's print reporter early in her career before moving onto Television. She appears in VIP Travel and several Patrons Only Cover Stories comics. Here, she's adjusting her stocking before her camera crew returns. Leah Coulter will succeed in whatever she does in her life. She got that from her parents, Elizabeth and Chris. 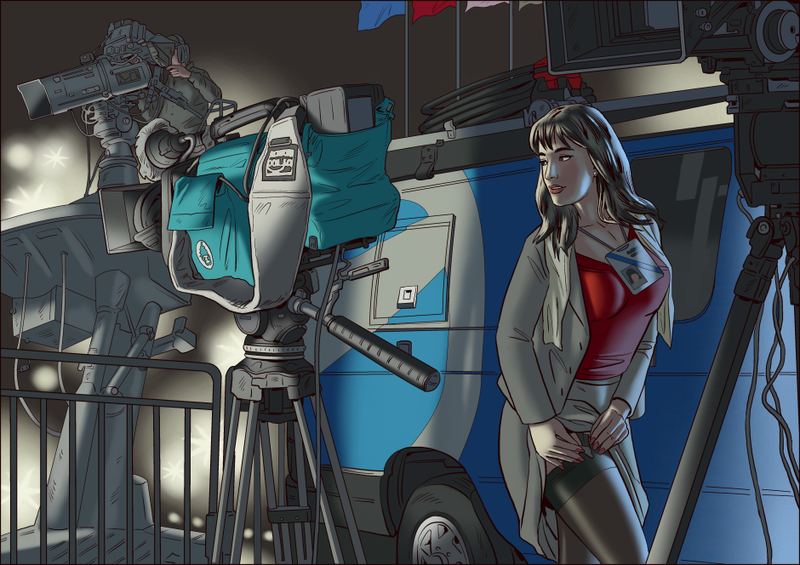 As a news reporter she eventually moves into television where this comic picks up and introduces her and her new career in broadcast television. I can envision some naked possibilities as time goes on because Leah prefers to be naked if she can. I believe she will find unusual and interesting ways to present her work in a naked way that will surprise everyone. Let’s see what happens.